In case you haven't picked up on it yet, I love lists! I do! The sense of accomplishment you get when you check it off is good for me. To take it a step further, if something is completed and it isn't on the list, yes-I-sure-will add it so I can check it off. So in the spirit of lists, when I was reading Heidi's on Fabric Mutt the other day, it was impossible to not join in. This originated over at Shannon's blog, and it's a lot of fun to go read the answers of other participants. *i'm longing to make "my Big Ten quilt" right now. * i want to try "making a recipe" with some "real vanilla beans"
* i wish i could sew with "voile" fabric. * i dream of making "a bohemian style tunic for myself". * i keep track of my ideas by "writing them on a post-it, pinning them to pinterest or taking a picture with my phone". * i'm inspired by "bright colorful anything". * i would love to meet "all of you" in person. * my favorite fiber is "cotton". * i like to sew with "the television on and a glass of vanilla tea with crushed ice". * my favorite color is "purple". * i rock at "hand sewn bindings". * i would like to learn how to make "anything with a zipper". * i like to listen to "the television" while i "sew". * i bring my "lip balm, hand sanitizer and mints" everywhere. 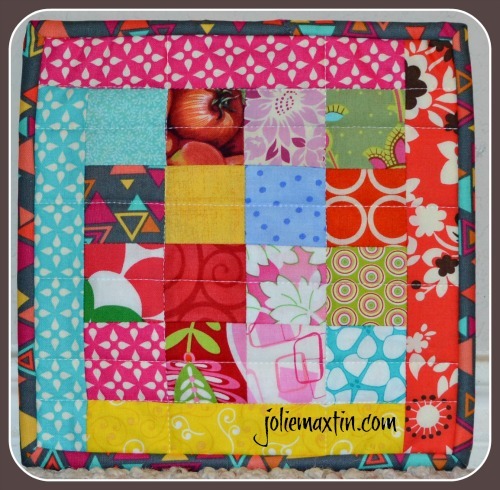 * my favorite thing to "sew" is "blocks". * my crafting space is "in real need of de-stashing". * if i had my own crafting room it would be "I do and it’s full of fabric and scrapbooking supplies". * i sew with "a Bernina". 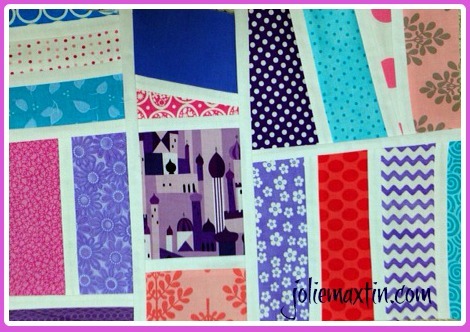 * i like to "purchase and consider the right project" with "new fabric lines". 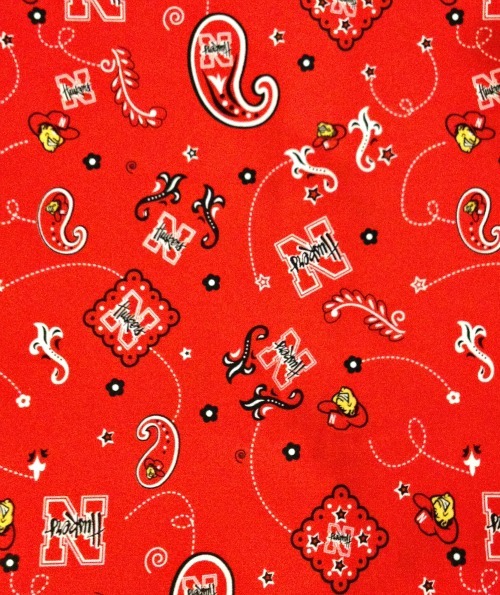 * i can never get enough "Nebraska fabric". 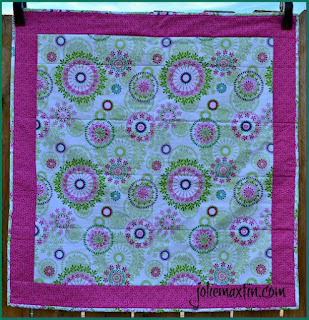 * i adore "making quilts". * i like to fill my shelves with "fabric and books". * i create the best when i'm "working by myself". * i am currently excited for "Wee Wovens". * right now i am "deciding what to make for my Modernista and Modern She Made partners". * i love to watch "Law and Order, Criminal Minds, college football, the Good Wife" while creating. * my guilty pleasure when it comes to creating is "spread all the fabric on the floor and stare at it for a couple of days until I decide what I like". * my current favorite music crush to listen to while creating is "Jason Aldean". 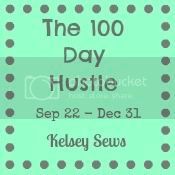 Kelsey over at Kelsey Sews has a wonderful challenge going on for those for us who need a bit of motivation. And since I have been traveling and not up on my blog reading, I have already lost 2 days and only have 98 - better get on it! If you are in the Modern She Made Swap - here is a button for you - enjoy!! Lounge Pants Class - Here I come! Isn't it funny how a piece of fabric can excite us? Well this one does it for me! Typically I am only a quilt maker and a sew a button back on a pair of pants gal, but....one of the classes I got registered for at Sewing Summit is Lounge Pants. I can't wait! It's so exciting!! Now it seems you cut them out, throw some elastic in the waist band, hem them up and zippa de doo da - you're done. Yeah....no idea about any of that, hence my need to get some instruction! Speaking of needing instruction, I did not get into the Zippers 101 class. Who knew? I figured all these wonderful, accomplished, sewing for years attendees wouldn't want a thing to do with it and I would get into it no problem. Nope. It's ok, I'll teach myself or tackle the teacher for a mini lesson, no biggie. But.....back to the Lounge pants - I'm going to use this fabric and I'm so excited!! What helps is that football season started and I love my team, love fall weather (which I miss living in Texas) and love putting up my red "N" flag every Saturday that we play. If these turn out, I might be making a lot of them for Christmas presents, or just a lot of pairs for Mr. Maxtin and myself. So co-worker A was going to have a baby and co-worker C and I sew, so we thought we would whip something up for her with coordinating fabric. Yeah, not so fast. First off, she had a pattern. You know the kind, Simplicity with printed tissue paper and everything. I'm sure these are valuable and helpful however, this is not the type of pattern I am used to. Since I only quilt, the format of choice is cut [qty here] of [dimensions here]. The paragraph style directions didn't work for me and so I started with it, but then had to chuck it and just go with my gut. You see, co-worker C and I got coordinating fabric and she made a comforter and baby bumpers (apparently, those are not "acceptable" anymore - but I didn't know that so no flames on this please) and I made a changing blanket. It was supposed to be a bit smaller, but hey, a little extra room isn't a bad thing. I finished it (after the baby was born - whoops) but it has now been packaged, labeled and given to Ellie's mom. 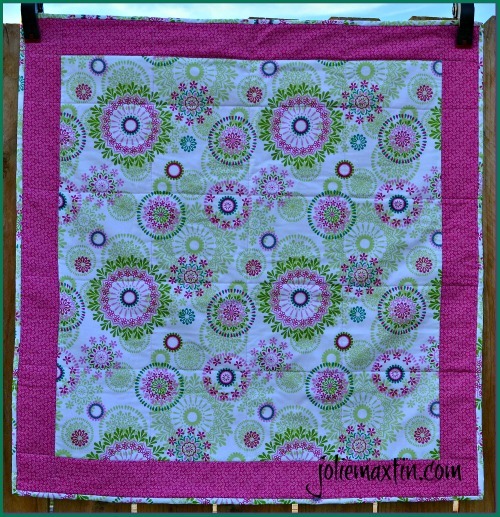 Although it is "officially" a changing blanket, it also fits into mini-quilt too! And the sun was not cooperating with me when I snapped the photo - sorry! 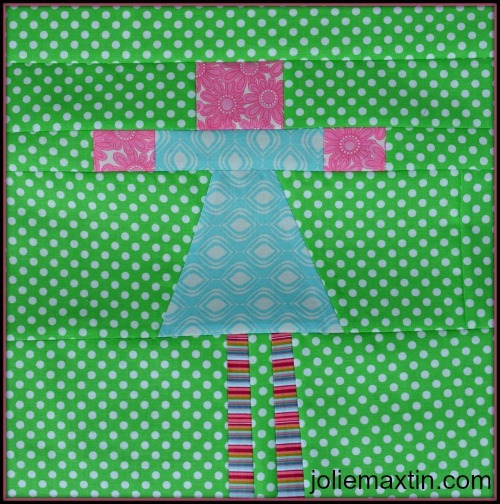 For our Modern 99 Bee this month, our hostess, Shawn, asked us to make a little girl. She has no preference on the color but is going to make some adorable quilts for her nieces for Christmas. This will be a quilt made with love and on the whimsical side! She provided a tutorial from Sarah and if you look at it you will see I used the same colors. You know why - because I loved them! Sometimes I find that I am not so creative but I follow directions beautifully. 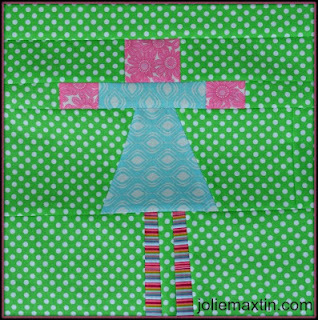 This was a fun block to make because it isn't so exact, just sew and go! It's on the way to you Shawn! Hi and happy day to you! I recently purchased the Fat Quarterly Shape Workshop and thought I would try out this block, Card Trick, by Katy Jones. 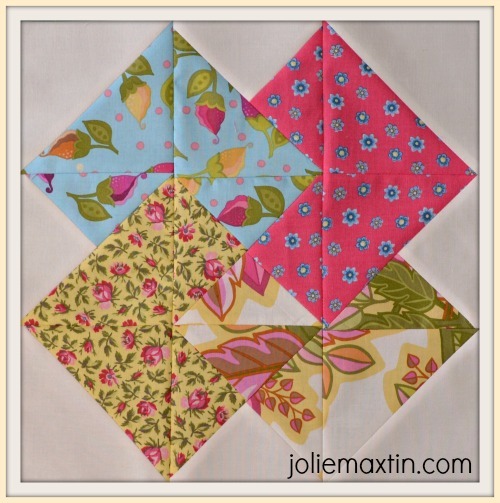 Typically, I do not care for HST (half square triangles) but I really liked the block so I thought, what the hey - I'll try it. First of all, I think this fabric is hideous! It was in my giveaway pile. I really have no idea why I bought it, as it isn't my style. But onto the block. I thought it turned out pretty bad, but actually now that I am seeing it in the daylight (finished it last night) it isn't so bad. Cutting and sewing all the triangles isn't so exciting for me, but the finished product is good. I doubt that I would make a whole quilt of these, but never say never. My mind is talking to me, because as I write this post and stare at the block, I think this block in solids would be really striking and you know what, I just ordered a boatload of Kona solids. I had to! They were on sale AND there are new colors I don't have - that can't be......(yeah, I come up with some crazy rationalizations to buy more fabric, but I know I am not alone). It is finally my turn for Mod Mosaic! I thought it would be easy to decide what I wanted, but it was not. I really loved Shelley's Black and White selection but didn't want to copy her. My request to my bee members is blue, purple and pink with white sashing. I'll be happy to share the blocks with you as they come in. My plan for these blocks is to use them, not as straight blocks, but perhaps as accent blocks. 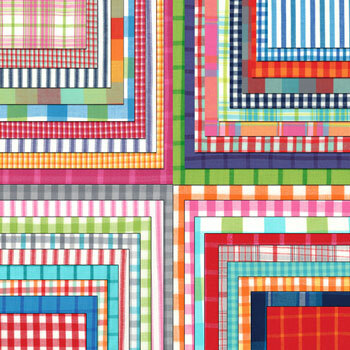 I am envisioning the Kitchen Windows quilt by Elizabeth Hartman, but perhaps a bit more random. I think using a solid and then adding these in, will make it will pop. What do you think? Here is my scrappy mug rug for my partner, in......Australia! She indicated that she likes bright colors so this is what I came up with for her. I have not heard back on if it has arrived yet, or if she likes it.....so.....I am waiting waiting waiting but I think it is happy and definitely summery! And you know, I always get mad at myself for signing up for these mug rug swaps, on top of everything else but I always like the way they come out. Plus it gives me a chance to work on my binding. I love to hand stitch the binding but getting the special cut, sew, slant so you can't tell where the connecting edge is.....yeah, still working on perfecting that. I do have the binding tool from the Missouri Star Quilt Company, but this was to little for me to use it on so I had to just dig in there and figure it out. It only took me 4 trys. Maybe next time it will be 3 (or less). A girl can hope right?